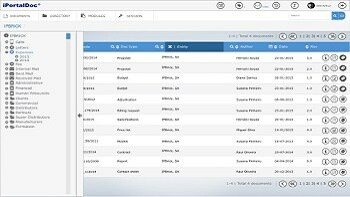 iPortalDoc is an integrated solution for Document and Process Management based on workflows. iPortalDoc allows the modeling and implementation of processes. A process triggered on iPortalDoc will always register the history of individuals involved, carried out interventions as well as documentation or e-mails associated, facilitating research and avoiding loss of time and information. It enhances processes in organizations and also increases productivity in different business areas. Communications, such as calls, e-mails and chat conversations, integrate with iPortalDoc. This is the only software that records and associates them to documents that can be accessed at any time. Standardization of all types of documents of the company, classification methods and entities; uniformization of processes, using always the same procedures. Digitalization of documents in paper format, producing electronic documents, which are classified and made available according to a certain criteria. Each employee only has access to the information related to his job, either at the level of folders, document hierarchy, documents, or even concerning features/actions of iPortalDoc. Decrease of flow of information in paper form, harnessing the physical space. Every information becomes digitized and forwarded through the application. Mail Archiving: IPBrick Mail Archiving is an innovative functionality that allows an organization to have full independent access and management over e-mails and processes, putting an end to scattered information across several people and systems. Restricted document access by user profile: Each employee has his own role inside the organization. iPortalDoc is flexible in which concerns to the attribution of user roles. Each user belongs to a group with specific permissions. This way, each employee only has access to information related to his or her function or role, whether it involves folders, which form the document hierarchy, or just documents. User's actions history: iPortalDoc creates a history of all actions related to Users and Documents. Email notification system: The user is notified by email whenever he needs to perform an action, ensuring that no action will be forgotten. Automatic triggering of actions and workflows: iPortalDoc automatically launches actions and flows over documents, helping the user not to miss or forget any corporate task. Creation of reports and decision making tools: It is possible to obtain detailed reports, through iPortalDoc, sorted by activity, employee or others, in order to obtain statistics of all company activity. These reports, which can be exported to excel, are important aiding tools in decision making, since levels of productivity, that are organized by area, department or employee, will always be know. Document template creation: iPortalDoc allows you to download templates from Microsoft Office and Open Office, which will then be converted into PDF documents; from here, you will be able to generate PDF documents based on these models. Management of emails as documents: Today, emails have taken the place of physical letters. Documents such as orders, invoices, contracts and so on, are now received through email. That doesn't mean they are less important, so iPortalDoc provides a way to manage them. Associating e-mails, calls and chats with documents: iPortalDoc allows to associate communication records with documents. Classifying documents through metadata: All entered documents into iPortalDoc are classified according to certain information, which serves to identify them. Digital signature: Allows digital signature in documents, in three different ways: signature through the Citizen Card (CC); Digital Signature and Digital Certificate. Document Versions – Control and Update: iPortalDoc allows you to update a document in the system without losing previous versions. The system shows the latest version of a document, while access to previous versions is very easy and intuitive. Adds comments to documents: This function allows you to add comments or important notes to a document. Document sharing in the Enterprise Social Network: Through iPortalDoc, it is possible to share documents in the Enterprise Social Network, IPBRICK.CAFE. All you need is a click to share your documents with all users or with a specific group of users. Multi-platform: iPortalDoc is completely compatible with all devices with an internet access via browser. This means that it is compatible with all desktop computers, portable computers, tablets, smartphones and it will operate within the latest version of any browser in the Desktop version. Multilingual: iPortalDoc is available in 4 languages: Portuguese, English, Spanish and French. This means that whenever an organization, that works with iPortalDoc, has employees of different nationalities, they will be able to choose the language they prefer working with. Easy search: iPortalDoc allows you to perform a simple or advanced search to find documents containing the search term in their key-words, titles, summaries, descriptions and/or authors. Intuitive web interface: The use of iPortalDoc does not require software installation on desktop, it is only necessary a web browser. Since the majority of professionals knows how to use these applications, the learning process for using iPortalDoc is quick and easy. Document hierarchy archive: Documents are organized in a document hierarchy, which respective folders and sub-folders are disposed according to the function of each organization.